Arbatel: De Magia Veterum is a 16th century European mystical text, likely published by Peter Perna in Basel, Switzerland. It is what most people would call a grimoire, which means a catalog of spirits along with instructions on how to contact and work with them successfully. The FIRST is called ISAGOGE (overview, BM), an Instruction book of magic or things spiritual, which in 49 most general Aphorisms contains the lessons of the whole art. The Isagoge of the Arbatel is one of only a few magical texts that deal with the so-called Olympic spirits. It postulates that each of the traditional seven planets and lights (Moon, Sun, Mercury, Venus, Mars, Jupiter, Saturn) have assigned to them an Olympic governor spirit which enacts the tasks associated with that planetary realm. They are ambassadors of these seven spheres that are well accessible to and friendly towards humans. According to the table of contents, the third volume was supposed to be solely about these spirits. Along with information on these spirits, the text gives general advice on how a white magician should conduct themselves. There is a notable leaning towards Christian new testament ideas, with a focus on biblical wisdom and helping others. Although not widely known even in occult circles, the Arbatel has become one of my favorite books. The instructions given regarding the Olympic spirits are straight-forward. The more philosophical parts do a very good job at producing a mindset in the reader that is highly conducive to magical work and teaches the right attitude. So now that I’ve convinced you that this book is really awesome, what edition should you get? This is, after all, a pretty old document, so there are several translations and redactions published by different people. In printed form I know and possess only one, and it’s hard for me to conceive that there should be a better one. I’m talking about the edition by Joseph H. Peterson. He is a scholar who is very well versed in ancient magical texts. He provides a lot of material at no charge on his website Twilit Grotto. Among the translations that I know this is the best, adhering closely to the original text while still being highly readable. It’s beautiful. Moreover, it is bilingual, so you can always look at the original Latin wording and translate it on your own. In addition to the text itself, Peterson wrote an extensive introduction that provides valuable background information on the history and meaning of the text. Along the text copious footnotes elucidate the origin and meaning of certain passages. The typography is beautiful, and the book itself is made of high-quality materials. All in all I sincerely believe that this is a book that should be in every magical library. A scan of an 18th century document by Andreas Luppius, containing a translation of the Arbatel text into German. It seems to be a quite faithful translation, though Wikipedia claims there are some mistakes in it. I think the sigils came out nicely in this. A. E. Waite, Golden Dawn member and prolific author, editor and translator, wrote a book called “Book of Ceremonial Magic”. In the second chapter he introduces the reader to the Arbatel and the Olympic spirits. This can be a useful supplementary resource, though some of his interpretations seem a bit dodgy to me. Caveat emptor. The original Latin text alongside Robert Turner’s English translation. Insight into the method used in constructing the sigils of the Olympic spirits. Like me, Frater Acher has evoked all of the Olympic spirits and reports his experiences in detail. Unlike me, he used an approach that includes months of preparation and a physical temple, very much in the tradition of Victorian ceremonial magic. Also check out my blog posts detailing my first encounters with the Olympic spirits. I create out of love, and there is no requirement on your part to do anything in return! 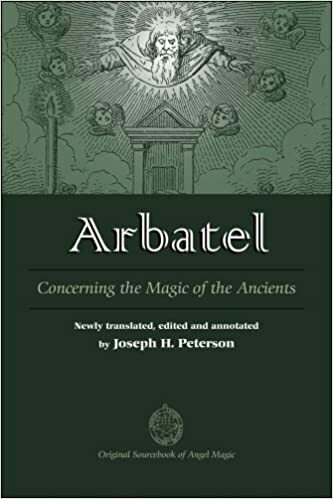 🙂 If you wish to support me you can buy Joseph H. Peterson’s Arbatel edition through the link below and I will receive an affiliate compensation. If you wish you can also donate, check out the box on the right side of the page. Booking a reading is also a great way to support me and get a thorough analysis of your magical and spiritual talents.